frankly my dear...: From the Patch - Peas. 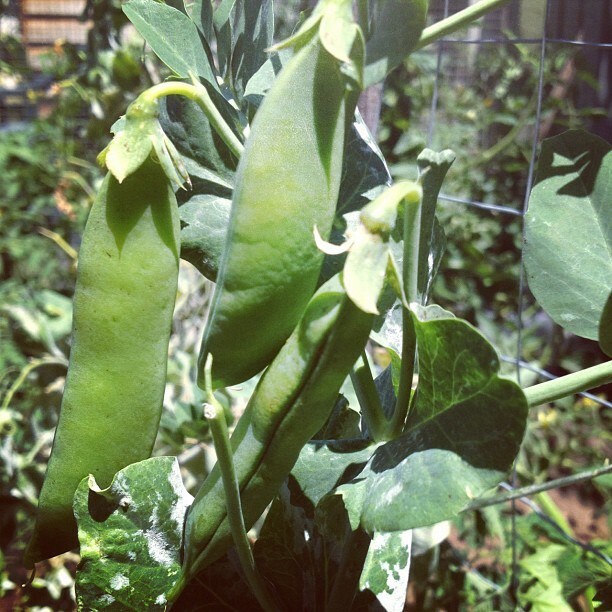 Oh my goodness there's nothing better than fresh peas straight from the garden! So sweet & yummy. Peas from our patch rarely make into our house............three little munckins go to The Patch when they're hungry & eat them fresh (and One Bloke!). But occasionally when no one is looking i'll sneak out & pick a handful & then smuggle them into the kitchen to make the yummiest salad ever. I saw Jamie Oliver making this on one of his very first cooking shows (back in the early days of lusting after him), it is so simple & soooooo good. Do yourself a favour - try it. Baby Spinach, Fresh Pea & Fetta Salad. Blanch the peas in boiling water. Allow peas to cool & toss with the spinach. Crumble fetta over the top, then dress with olive oil & white wine vinegar or lemon juice.